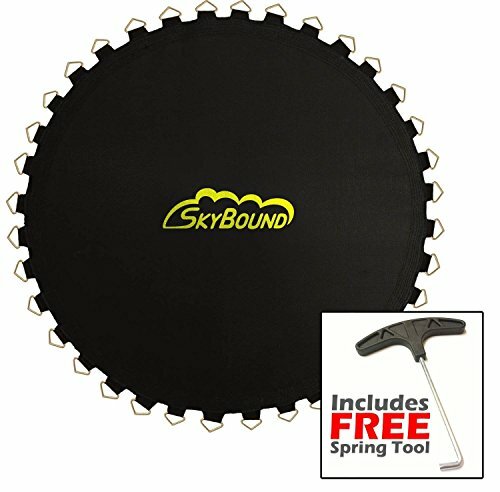 Skybound Premium Trampoline Mat (Round, 14 Ft. Frame / Fits 72 x 5.5'' Springs) by SkyBound at Scruffs Game. MPN: 4334098252. Hurry! Limited time offer. Offer valid only while supplies last. 150 inch wide SkyBound brand trampoline mat with 72 rings. This mat is designed to fit 14 foot wide trampolines that use 72 x 5.5 inch springs. 150 inch wide SkyBound brand trampoline mat with 72 rings. This mat is designed to fit 14 foot wide trampolines that use 72 x 5.5 inch springs. Compatible brands include bounce pro, sportspower and many other trampolines, including the Walmart 14ft trampoline. Includes a free spring pull tool! a $9.99 value!